Middlesbrough, Leeds United, Stoke City and Derby County are among the teams making the news in the Championship today. 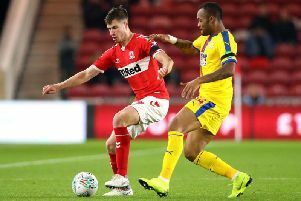 First up is Boro, with reports coming from their Austrian training camp of a 'bust-up' between striker Britt Assombalonga and boss Tony Pulis. There were claims that the pair had a serious disagreement at the club’s pre-season trip which has led to speculation that Assombalonga could be set to exit the Riverside. Assombalonga joined Boro for a club record £15million fee last summer from Nottingham Forest. Boro have been linked again with a move for their former midfielder James Morrison, now at West Brom. Another player they have been credited with an interest in is Newcastle winger Matt Ritchie, but Stoke City are in pole position to sign the Scotland international. However, reports today say that the Potters had a £15million bid for Ritchie rejected as Rafa benitez wants a replacement lined up before he will agree to sell. Stoke have already brought in Oghenekaro Etebo and Benik Afobe, and need a creative replacement for Swiss star Xherdan Shaqiri who is expected to depart after relegation. Elsewhere, Leeds are reported to be tracking Chelsea goalkeeper Jamal Blackman with Marcelo Bielsa hoping to add a new goalkeeper to his squad this summer. Blackman impressed on loan at Sheffield United last season. Meanwhile Brighton, having already raided Sunderland for goalkeeper Jason Steele, are looking at the Championship for another shot-stopper to act as back up to No 1 Mat Ryan. The Sun reports that Chris Hughton is ready to bid £2.5million for Derby County goalkeeper Scott Carson.